Christians and Muslims together make up about 57% of the world's population today, and by the end of the century they will constitute about 66% of the world's population. More than any other single factor, the wellbeing of our children and grandchildren may depend on how well Christians learn to relate to Muslims - and Hindus, the next largest faith, not to mention Buddhists, Jews, people of indigenous faiths, and the nonreligious. We know how to have a strong Christian identity that is intolerant of or belligerent towards other faiths, and we know how to have a weak Christian identity that is tolerant and benevolent. But is there a third alternative? How do we discover, live, teach, and practise a Christian identity that is both strong and benevolent towards other faiths? In this provocative and inspiring book, author Brian McLaren tackles some of the hardest questions around the issue of interfaith relations, and shares a hopeful vision of the reconciliation that Jesus offers to our multi-faith world. Why Did Jesus, Moses, the Buddha and Mohammed Cross the Road? by Brian D. McLaren was published by Hodder & Stoughton in September 2013 and is our 14095th best seller. 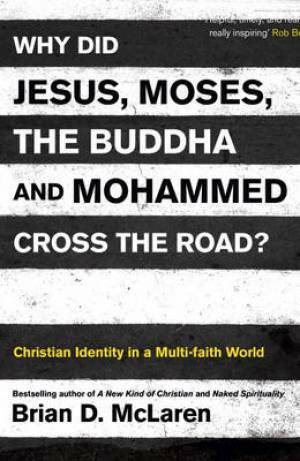 The ISBN for Why Did Jesus, Moses, the Buddha and Mohammed Cross the Road? is 9781444703689. Buy Together Offer for Why Did Jesus, Moses, the Buddha and Mohammed Cross the Road? Reviews of Why Did Jesus, Moses, the Buddha and Mohammed Cross the Road? Be the first to review Why Did Jesus, Moses, the Buddha and Mohammed Cross the Road?! Got a question? No problem! Just click here to ask us about Why Did Jesus, Moses, the Buddha and Mohammed Cross the Road?. Details for Why Did Jesus, Moses, the Buddha and Mohammed Cross the Road?